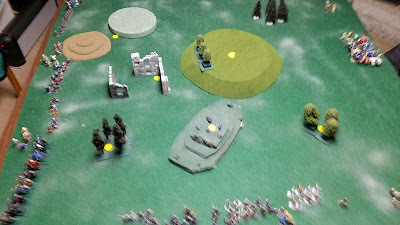 Picture 4: Blue Army crossbow men swarm the Red Army 2-handed weapon men. Also pictured (on horse) is the Blue Hero, Sir Bluford of Handiopolis (Dex 5, Cha 6) who's helping as best he can, bless his heart. Picture 5: tangled melee between the Red Army light cavalry and the Blue Army halberd and light spear men. 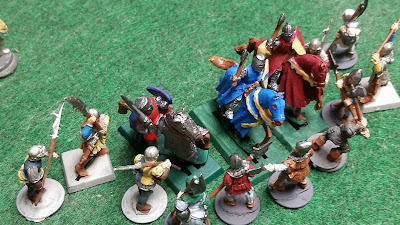 Marlon, leading the Red Army, did battle with Jason, leading the Blue Army to recover the 9 tokens representing the lost gold of the Gnome King. While Jason scored some notable tactical successes, such as killing the Red Wizard and charming the Red Hero, Marlon emerged victorious when he got 5 of the treasure tokens off board to safety. 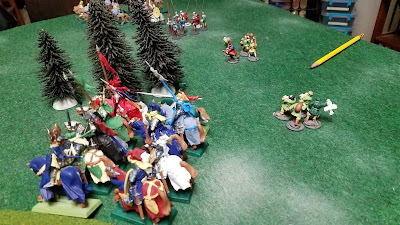 Picture 2) Red Knights Advance between the central hill and a grove of trees. 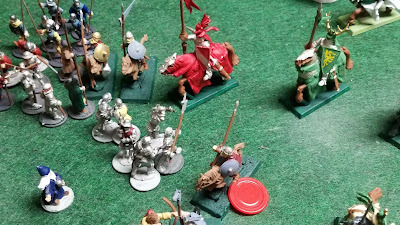 Marlon, Bob and Dave did board game night on Sunday. 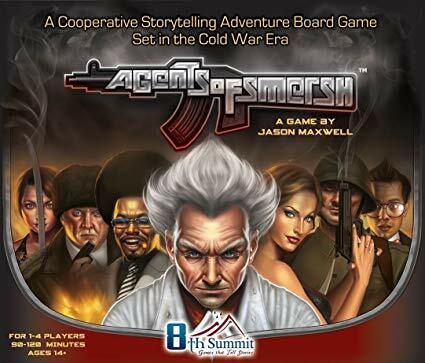 "Agents of Smersh", which we've played before, but which we flailed around blindly trying to remember how the rules actually worked. About half way through we got it all under control and managed to win relatively easily. "Escape from 100 Million BC" where we crashed our time machine and had to search the prehistoric wasteland for missing pieces, and rescue castaways (including Daniel Boone, The Mona Lisa lady and Teddy Roosevelt) who had been sucked into time vortexes, and send them back. We very narrowly won that one, but returned to a modern Earth that had been covered by flood waters due to all the paradoxes we caused. Bob also showed us some of the products of his new 3-D printer, which were pretty swell. I was looking at "Thingiverse" and thought that making a bunch of dungeon tiles might be a good use for the thing. 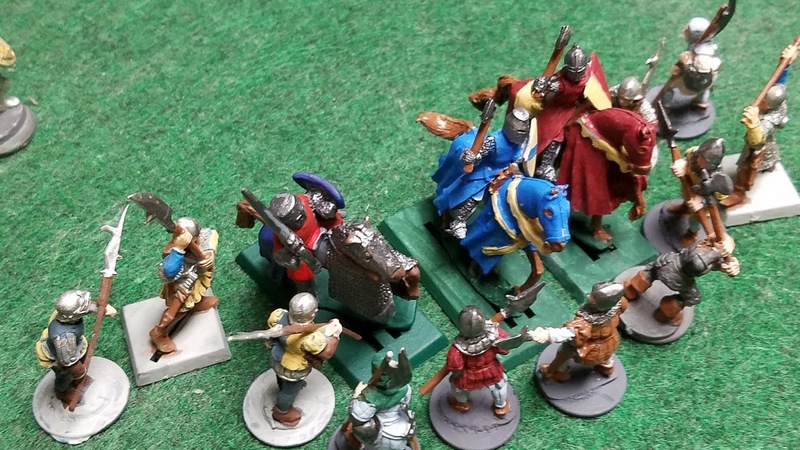 We'd then have a light-weight but modular way of setting up dungeon games. I saw a couple types that might be perfect. Game Schedule: after I get Annie back to school this coming Sunday, all my conflicts should be wrapped up. The game schedule should be as follows. 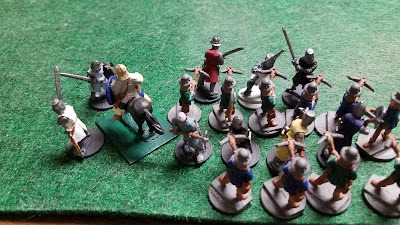 NEW CAMPAIGN: I am going to start the Blueholme, Old-School D&D campaign on Sunday, February 10. I've sort of lost all track of where the 5e campaign was going and what was happening and why. I need a little more time to get a pack of adventures ready and so forth. 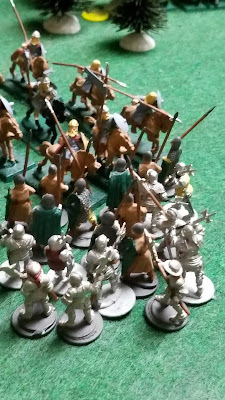 Sunday January 27: I'd like to do a big battle using lots of miniatures and the Blueholme rules, just to see how the chainmail weapons rules mesh with the D&D to hit system, and mostly because I like doing big battles with lots of miniatures. Sunday February 10: New Campaign Begins: character creation (fast!) and first adventure.